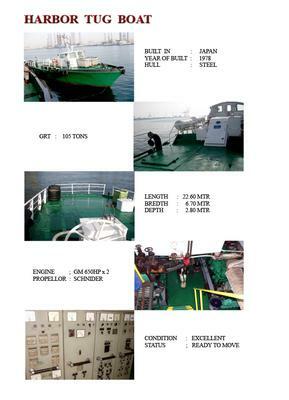 JAPAN made high proficient HARBOR TUG for immediate sale. The tug is ready for inspection at Kuwait water with all documents ready for verification. For any further information, parties may please contact Mr. Hussain Al Mulla on 00971559992277. HARBOR TUG FOR IMMEDIATE SALE.